Stunning home inside & out. Nearly an acre on the golf course. This home lends itself well to either an elegant or casual lifestyle, the perfect home for gatherings and entertaining. Offering beautiful views of the gardens and course from nearly all windows!. Kitchen is a gourmet's dream with two sink stations, Viking gas stove & griddle, island and lots of counter space, plus a wet bar close by! Spacious formal dining room with heavy molding as well as casual breakfast area. The screen porch will be where you enjoy casual relaxing and visiting, overlooking the grounds. The double living room offers two distinct sitting areas, one with a cozy fireplace. The other area has built in cabinets and shelves with a 12 ft. storage closet behind where you can access all your wiring! Lovely owner suite with spacious sitting room, and two guest rooms on the main floor. Lower level rec room with billiard table and sitting area plus the wet bar. Two lovely guest rooms with Jack & Jill bath there! 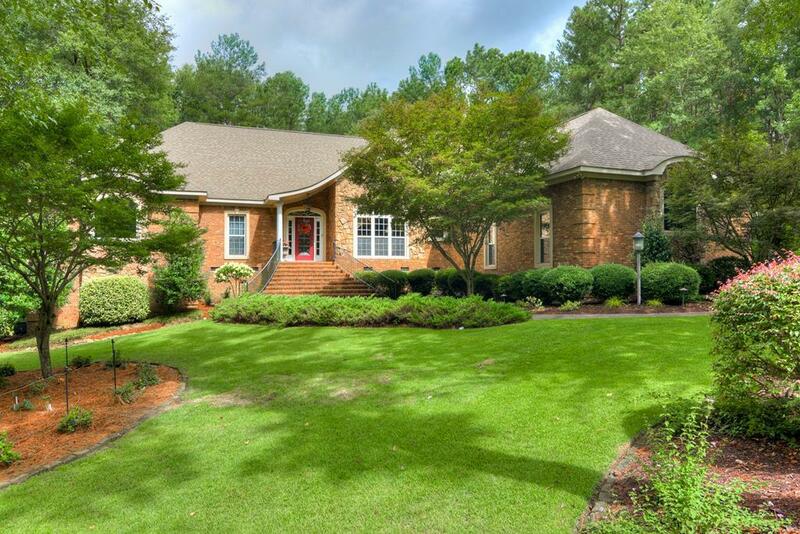 Listing provided courtesy of Steve J. Dubay of Meybohm, Llc North Augusta.